Adaptive structures have the ability to adapt, evolve or change their properties or behaviour in response to the environment around them. The analysis and design of adaptive structures requires a highly multi-disciplinary approach which includes elements of structures, materials, dynamics, control, design and inspiration taken from biological systems. Development of adaptive structures has been taking place in a wide range of industrial applications, but is particularly advanced in the aerospace and space technology sector with morphing wings, deployable space structures; piezoelectric devices and vibration control of tall buildings. includes discussions of the application of adaptive structures in the aerospace, military, civil engineering structures, automotive and MEMS. presents the impact of biological inspiration in designing adaptive structures, particularly the use of hierarchy in nature, which typically induces multi-functional behavior. sets the agenda for future research in adaptive structures in one distinctive single volume. 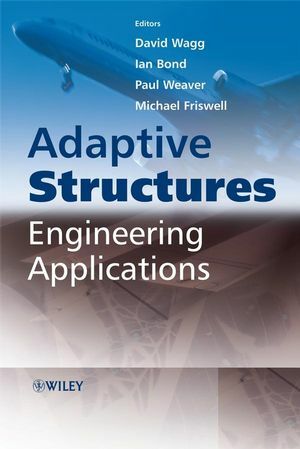 Adaptive Structures: Engineering Applications is essential reading for engineers and scientists working in the fields of intelligent materials, structural vibration, control and related smart technologies. It will also be of interest to senior undergraduate and postgraduate research students as well as design engineers working in the aerospace, mechanical, electrical and civil engineering sectors. The Editors are from the Departments of Aerospace and Mechanical Engineering at the University of Bristol. Friswell is the Sir George White Professor of Aerospace Engineering and currently a Royal Society-Wolfson Research Merit Award Holder. Bond, Drinkwater, Wagg and Weaver are all currently EPSRC Advanced Research Fellows. The editors have significant publication records in areas related to adaptive structures, which can be viewed from here: http://www.men.bris.ac.uk/ and http://www.aer.bris.ac.uk/. They are all involved in a significant amount of funded research projects (see http://www.epsrc.ac.uk/) – for example the new Bristol Laboratories for Advanced Dynamic Engineering (BLADE) funded by a recent £15 million JIF award (GR/R51261/01) as well as numerous other research projects funded by the EPRSC and industry. Inman is the George R. Goodson Professor of Mechanical Engineering, and Director of the Center for Intelligent Material Systems and Structures at Virginia Tech, USA. He is also the Benjamin Meaker Visiting Professor at Bristol.